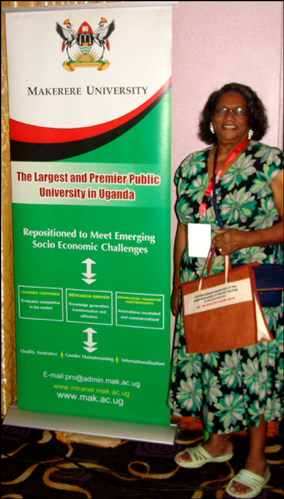 "Our Earth, Our Heritage: Harnessing Geospatial Technologies for Sustainable Development in Africa"
On October 24, 2016, Dr. Linda B. Hayden, Chair of the GRSS Underrepresented Committee and Dr. Alejandra Frery, GRSS Letters Editor traveled to Kampala, Uganda, for the International Conference of the African Association of Remote Sensing of the Environment (AARSE) held at the Hotel Africana and Convention Center. The conference theme, “Our Earth, Our Heritage: Harnessing Geospatial Technologies for Sustainable Development in Africa,” recognized not only the past efforts related to resource management challenges but also the current challenges in the global discourse. GRSS was a co-sponsor of the 2016 AARSE Conference. Dr. Kara Smith, of North Carolina State University, was sponsored by GRSS and presented her research on Lake Victoria titled: "A Prototype for the Application of Climate Information to Improve Highway and Infrastructure Planning in the Coastal Regions of Lake Victoria." The presentation can be viewed here in PDF format. 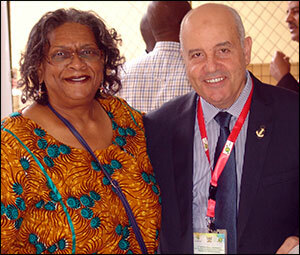 To the right is a photo of Dr. Linda Hayden and Dr. Saleh Mesbah El Kaffas, head of the Remote Sensing Spatial Studies Unit at the Arab Academy for Science, Technology, and Marine Transport. Dr. El Kaffas will assist with coordination of AARSE 2018 conference to be held in Egypt.